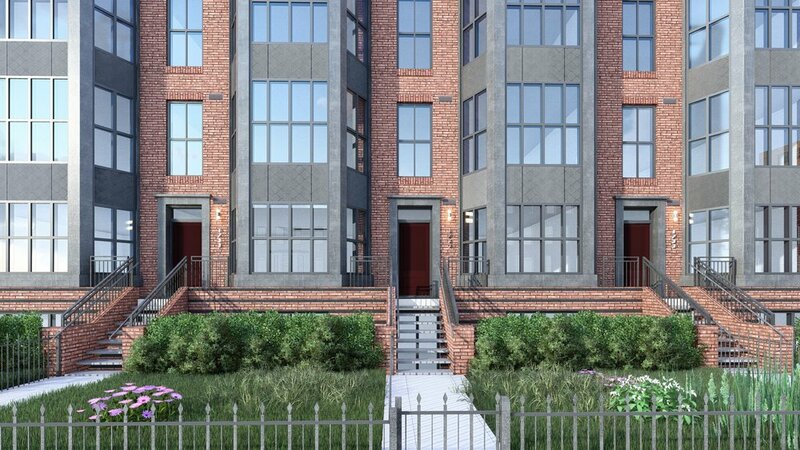 This four story (plus penthouse) Residential Development project is located at 1733 16th Street NW in the Dupont Circle neighborhood. 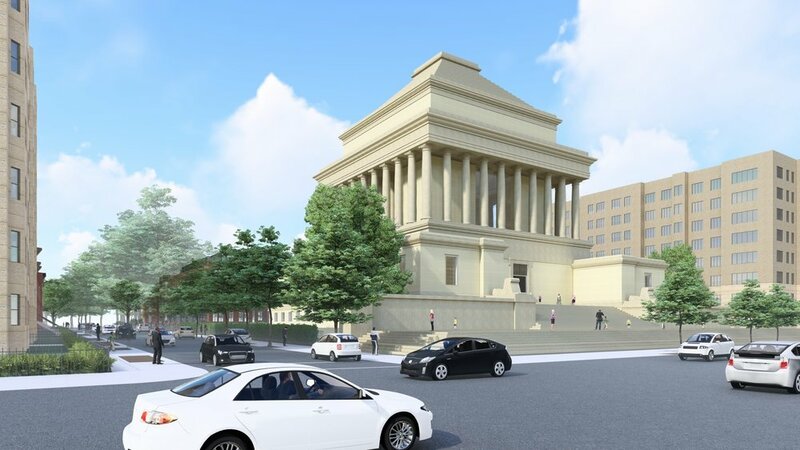 The proposed project sits directly to the east of the Scottish Rite Temple (a historic landmark structure designed by John Russell Pope, constructed 1911-1915) bounded by 15th Street NW to the east, S Street NW to the north, and a 15' wide Public Alley to the south. (Project SSL information: Square 0192, Lot 0108). The residential project will consist of approximately 125-150 rental dwelling units—approximately 128,000 GSF of residential area. There are four stories of above-grade and two stories of English Basement-level residential units. The proposed project will also incorporate various amenity areas for the building and a generous, private courtyard space facing the apse of the Scottish Rite Temple. There are two levels of below-grade parking, providing approximately 110 parking spaces. One level of penthouse is also provided, which houses residential units, building mechanical spaces and an amenity area (roof terrace and pool). Permanent, covered bicycle parking is provided within the building and temporary bicycle spaces will be incorporated into the final streetscape design. The overall building massing is a “C” shape, which incorporates the existing carriage house into the lower (south) “leg.” A lushly planted private courtyard (for building residents) occupies the inner area of the “C.” A linear park, running north-south, connects S Street to the public alley and allows views of the temple apse. The building massing is broken into three components: a symmetrical, classically proportioned, apartment “building” (containing the residential lobby), a run of smaller scale “townhouse” vocabulary along 15th Street (that runs to the corner of 15th and S Streets), and finally another run of smaller scale “townhouse” vocabulary (approaching the temple along S Street). Projecting bays, some rectangular (at 15th Street) and some angled (at S Street), further articulate the building components and break down the overall building scale. Brick detailing and window patterning further add to the residential scale and reading of the building. An areaway wraps a portion of the north and east building faces of the building to provide light and air to the English Basement levels below. 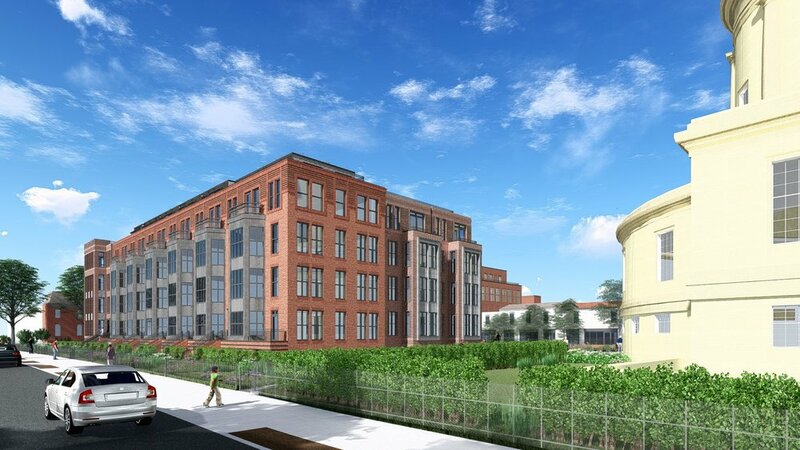 The Residential Building entrance is located on southeast corner of the site on 15th Street NW. 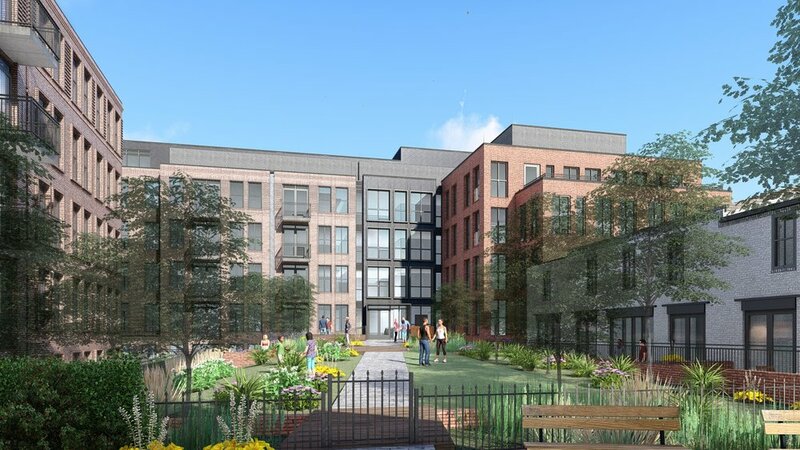 The building elevations along 15th Street and S Street are pulled inward, off of the property line to provide a generous planted streetscape area, matching the look and feel of the many front yard garden/entry areas of the surrounding neighborhood. Private, off-the-street entrances are also provided for the “townhouse” scale sections of the building. A portion of the south face of the residential building is also pulled north 5'-0" off of the property line to effectively widen the 15'-0" public alley to 20'-0" in width at the loading, trash, and parking ramp/entry areas. The building is predominately brick, to further allow it to fit within the context of the surrounding neighborhood. Two brick colors are proposed: a medium red smooth brick at the corner lobby block and along the S Street “townhouse” run, and a pink velour brick at the 15th Street “townhouse” run and corner. The projecting bays themselves are a combination of brick and/or gray metal panels. Stone accent panels are also proposed at the rectangular bays and at the 15th and S Street corner. The penthouse is a dark gray metal panel, reminiscent of nearby rooftop gables and dormers. The existing carriage house will be painted, and new openings will be added to the north, west, and south façades. The overall lot is split-zoned between zones RA-8 and RA-9 and consists of 92,220 GSF. The lot is to be subdivided along the north-south zoning separation line, dividing the lot into two separate record lots—with 46,099 GSF to the west (Zoned RA-9) (the Scottish Rite Temple Site) and 46,121 GSF to the east (Zoned RA-8) (the new residential project site, this project). The lot is located within the 16th Street Historic District and the Greater 14th Street Historic District and is subject to Inclusionary Zoning (IZ). The building is designed as a Matter of Right Development and no zoning variances or code modifications are being sought. The various bay projections and areaways shown are all on private property (i.e. not in public space). Parking is provided in the two levels of below-grade garage immediately underneath the residential building. Approximately 110 parking spaces will be provided, including approximately 40 parking spaces designated for use by the Scottish Rite Temple. 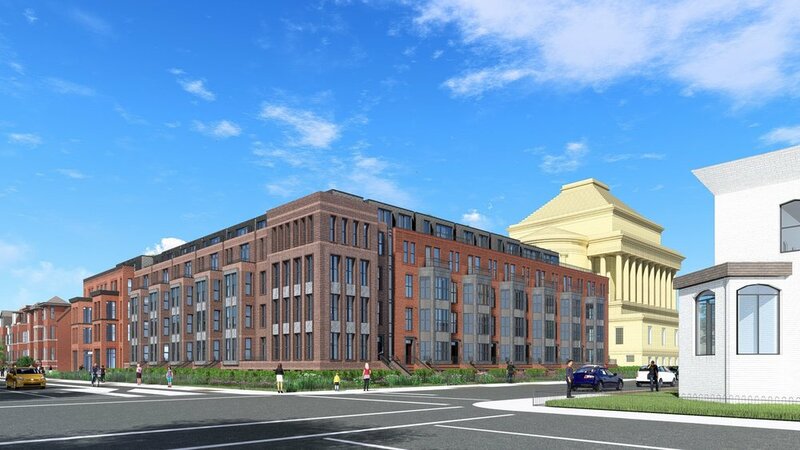 A 50% parking reduction has been applied to the overall parking requirements as the site falls within the path-of-travel distance requirements to the U St/African-American Civil War Memorial/Cardozo metro station. Access to the parking area will be via an entry and ramp on the public alley to the south of the site. Access to the building’s loading and service area will be off of the public alley as well. The new residential building will be pulled back 5' from the property line to effectively provide a 20' alley width to both the parking access and the building’s loading and service area. Parking spaces are a mix of 9'-0" × 19'-0" and 8'-0" × 16'-0" (compact). A loading space of 30'-0" × 12'-0" × 14'-0" and a service space of 20'-0" × 12'-0" × 14'-0" are provided. Aisle widths within the garage are 20'-0" wide (minimum). The roof will support a penthouse level, housing mechanical, residential, and residential amenity space, and will comply with the Penthouse Zoning Regulations (height and setbacks). The roof will consist of mechanical units and condenser units, private roof terraces, and a building roof deck and pool (for residents only). The site falls within the 16th Street Historic District and the Greater 14th Street Historic District. An existing carriage house structure (actually a conglomeration of several structures added over time), dating from the late 1880s and early 1900s, sits on the southwest corner of the residential site (facing the public alley) and is to remain. The carriage house has been designated as a historic contributing structure. 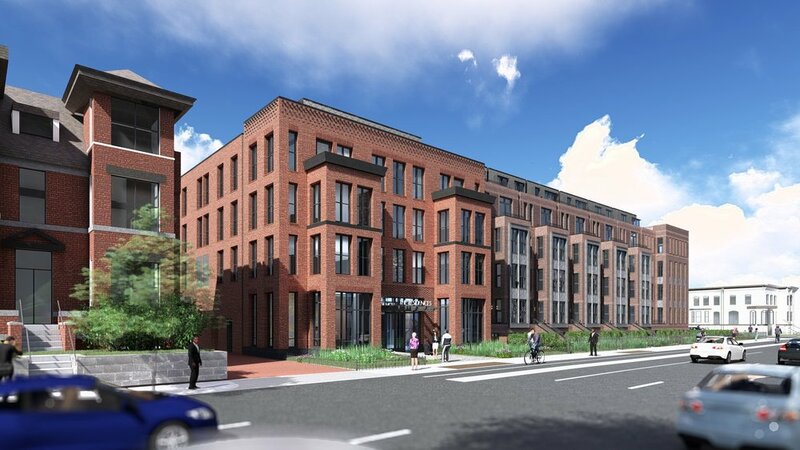 The new residential project will face 15th Street, S Street NW and the alley, and will incorporate and re-purpose the existing carriage house. This project will be in compliance with the District’s Green Construction Code, Energy Conservation Code, and meet the Green Area Ratio zoning requirements.